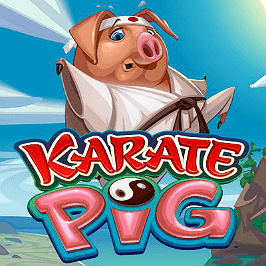 Karate Pig is a fun online slot machine from Microgaming based on a multi-talented Japanese pig. Yes, you read that correctly. This five-reel, 40-payline slot features a free spins round with a top prize of 800,000 coins and a multi-level bonus game where the pig shows off his skills and potentially wins you some big prizes. Want to find out more about the Karate Pig? Then stay here and read our in-depth slot review. With the Karate Pig slot, Microgaming has combined an Oriental theme with a martial arts-loving animal, perhaps taking inspiration from the hit animated film Kung Fu Panda. Admittedly, it’s a bit of a left field theme but it’s fun and silly as slot games can be sometimes. With 40 paylines, five coin levels and coin values ranging from 0.01 to 0.20, the Karate Pig slot suits all types of players. Your bet can be as little as 1p or as much as £40, with a jackpot of 10,000 coins on offer. As well as the background music, the symbols on the reels also have an Oriental flavour. Among them are a bonsai tree, a gold Buddha, a white cat, a sushi hut and a boar. Karate Pig himself is the highest-paying of the lot, with five of the comical character on a payline awarding you the 10,000 coins jackpot. 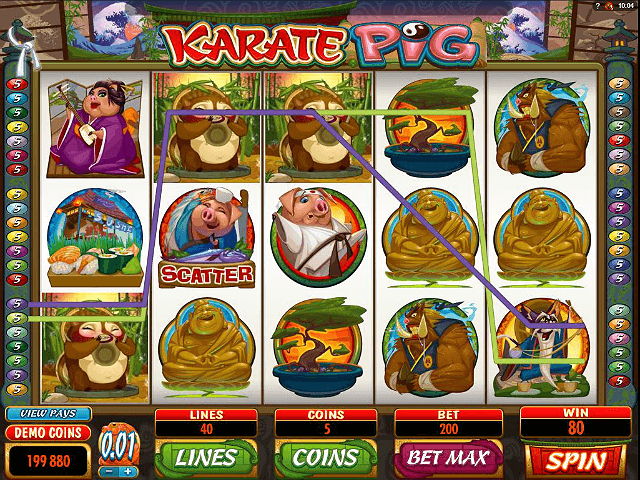 “Kiai!” Unlike most slots, Karate Pig doesn’t pay out for matching two symbols. Instead, you have to land at least three, apart from the wild, which is the game logo. Two of these will return 50 times your coin value, while five bag you a cool 10,000. The wild is also stacked and substitutes for all emblems except the two scatter icons. The bonus features are where Karate Pig slot machine really comes into his own. First there’s a free spins round that’s triggered by landing the golden pelican scatter symbol on reels one and five. This grants you 15 free spins but can also be retriggered during the feature, giving you even more spins. All wins are doubled during this round and you could win up to 800,000 coins. 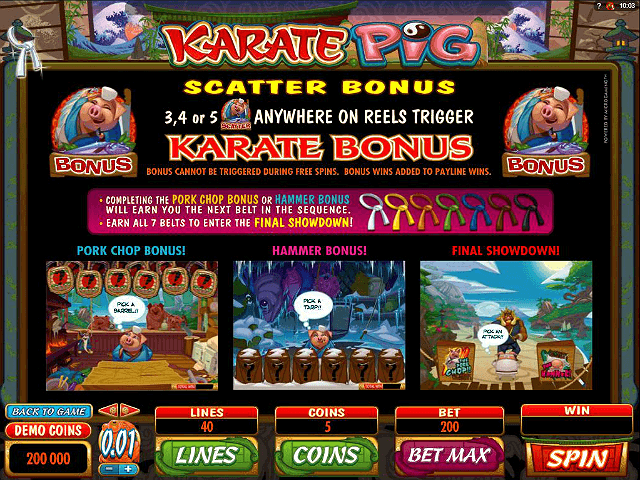 The other scatter icon stars our friend the Karate Pig again, and landing three, four or five of him anywhere on the reels launches the Karate Bonus. Here you have a choice of two features: Pork Chop Bonus or Hammer Bonus. In both you have to pick three from six options. 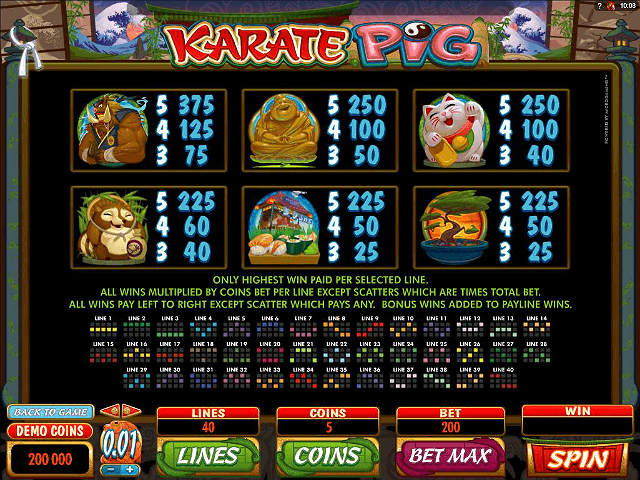 As you select each one, Karate Pig will show off his martial art moves and earn the points that make up your winnings. Every time you play the Karate Bonus you’ll also earn a belt, and once you’ve collected seven belts (i.e. you’re a black belt) you’ll be able to play the Final Showdown Bonus. This sees our porky friend taking on the boar in a three-round battle, and if the pig wins you could be in for a big prize. You don’t have to wait until pigs fly to scoop big money in this slot (sorry!). 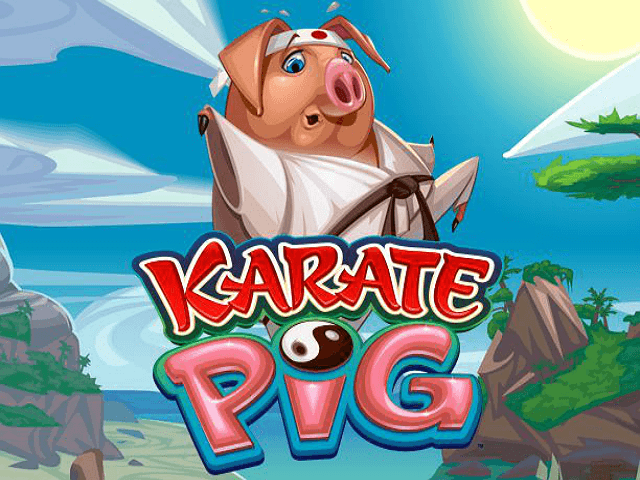 So join in the fun with Karate Pig, whose prowess could earn you more than just a black belt. If you like Karate Pig - You'll like these slots too!